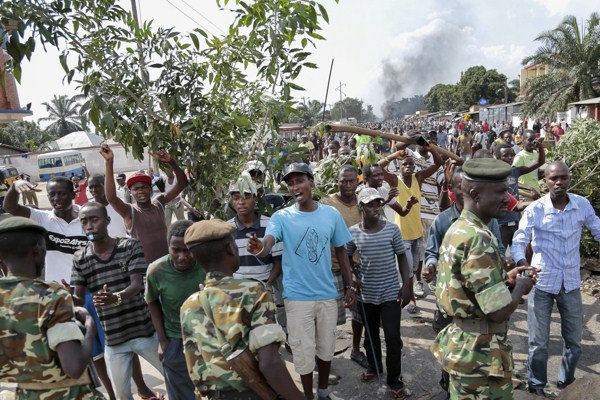 Opposition demonstrators hold branches as a peace symbol as security forces try to prevent people moving out of their neighborhoods, Bujumbura, Burundi, May 27, 2015. (AP photo by Gildas Ngingo). Burundi’s army has been at the center of attention in light of the country’s ongoing political crisis, particularly after Gen. Godefroid Niyombare’s coup attempt last month. But the failed coup was not the only reason for that focus. The army is a key player in Burundi’s politics, as its existence and ethnically balanced composition represent one of the most successful results of the Arusha peace agreement that formally ended Burundi’s civil war in 2000. Despite the many reservations raised against the accord when it was signed, its detailed provisions for ethnic power-sharing in all state institutions, including the military, have helped maintain Burundi’s relative stability since then. President Pierre Nkurunziza’s attempt to reinterpret one of the deal’s central points in running for a third term directly challenged that power-sharing provision of Burundi’s peace. It was no surprise, then, that his move evoked protests, not only from the opposition and international partners, but also from members within his party and, as the failed coup demonstrated, military officers.